The relationship I share with my eyebrows is almost comical. They’re blonde, so I usually make excuses and forgive them their unruliness. I can generally ignore them, but I still have an instant flash of self-hatred every time I catch a glimpse of them in my car’s rearview mirrors. (What is it about car mirrors that make us look so awful? Is it all that pesky natural sunlight combined with the mirrors’ utilitarian magnifying powers?) So when I had the opportunity to pick up a book all about eyebrows, I wondered if I would retain interest at all. Imagine my delight when the first few pages of Raising Eyebrows: Your Personal Guide to Fabulous Brows by Cameron Tuttle called me out on my brow excuses and asked me to define my brow relationship. 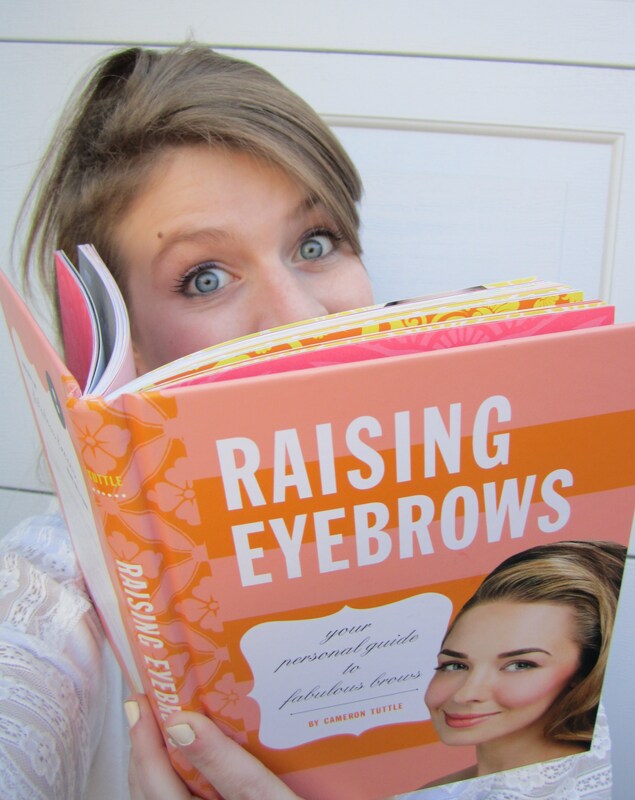 Raising Eyebrows, a most comprehensive overview of this neglected topic, contains everything you ever wanted to know about eyebrows: including the things you never thought you wanted to know until you read them. If you are looking for a superficial eyebrow maintenance manual, you won’t find it here. Loosely affiliated with the amazing beauty brand we all know and love, Benefit, we are assured the best quality from all of this advice. And, all-in-all, the entire book is a captivating read. Cameron Tuttle traces the biological evolutionary process of eyebrows, explaining how the furry beasts perched atop our faces developed to filter out potentially hazardous substances from getting in our eyes. She traces beauty’s eyebrow obsession back to the Ancient Egyptians, and shows the shape trends (and their societal connotations!) of successive eras. Celebrities and historical figures known for their notable brows (Frida Kahlo, anyone?) are spotlighted. Not a brow believer? Tuttle will continue to call you out through her pages. “It’s page 73 and you’re still holding this book,” she taunts as she moves away from her historical factoid segments and into her how-tos. All the tips, tricks, and tools you could ever need are here, with the pros and cons of hair-removal methods and trendy shapes. Combined, Raising Eyebrows almost tempts me to pick up a pair of tweezers and rejuvenate my sorry brows. Almost. Pick up yours on Amazon today!